Wales need all the help they can get to get out of Pool A. THE RUGBY WORLD Cup is over before it got started for Wales fullback Leigh Halfpenny. The Toulon man was stretchered off after an awkward fall during Saturday’s 23 – 19 warm-up Test against Italy. Today, after L’Equipe reported that the Welsh Rugby Union had informed Toulon to expect Halfpenny sidelined until March, the WRU confirmed the diagnosis of a ruptured anterior cruciate ligament, the same knee injury that is keeping Wales centre Jonathan Davies out of the tournament. If the six-month timeframe proves to be accurate, the 26-year-old would be missing not only for a large part of Toulon’s season, but also for much of Wales’ Six Nations campaign. Scrum-half Rhys Webb also remains unlikely to feature at the Rugby World Cup after taking ankle and knee knocks in the same game. However, the WRU have issued no further update on the injury sustained by the Ospreys man. Email “Halfpenny ruled out of World Cup and the next 6 months with ACL injury”. 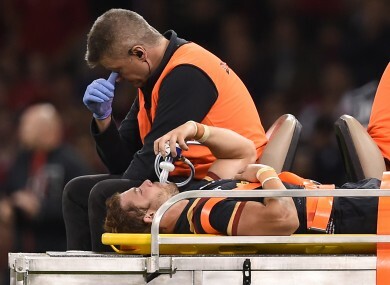 Feedback on “Halfpenny ruled out of World Cup and the next 6 months with ACL injury”.